The origin of the company name New Era has already been referred to on the ‘Before Minis’ page. Namely that in the late 1950s, Ken Nightingale started a small automotive business at 1A Caroline Street in central Birmingham. It was a small garage which acted as agents for Alexander Conversions Ltd, a company that manufactured ‘go faster’ conversions for the BMC cars of the time. Initially the business was called Ecurie Rossignol Ltd (Team/Stable Nightingale in French), but this was not a popular name with customers! Later it was changed to New Era Ltd, the Era being an abbreviation for Ecurie Rossignol Accessories. It had to be New Era because the company English Racing Automobiles had long since registered ERA as a name. Initial work on New Era Minis took place at Burt Brothers, a traditional Birmingham engineering company where Ken Nightingale was managing director until it closed. 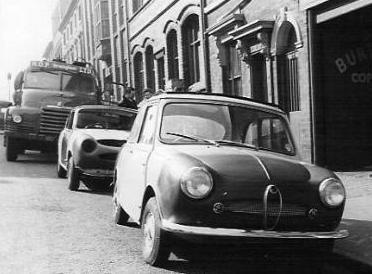 The picture above shows the first and third New Era Minis outside the Burt Brothers premises. Later work on the cars moved to the Caroline Street garage premises. The New Era building in Caroline Street had a ‘modern’ brick front, but it was, in fact, a Nissen hut, albeit quite well fitted out with a small showroom for Alexander Conversions products, a garage area including a post lift, a stores and a toilet. The photograph to the right includes a doodle by Ken Nightingale to indicate how the second New Era Mini could have been styled, but it also shows the door to the garage and stairs leading to New Era’s adjoining office. The garage business did not flourish, the mechanic and assistant left, and the business changed to that of manufacturing car accessories designed by Ken Nightingale. Some were specifically Mini accessories, such as the seat adjustors, steering column rake adjusters, pedal extenders and dashboard conversions. However, the ones that sold in reasonable quantities were the more generally applicable anti-theft devices for cars, lorries and trailers. They were covered by patents, the most significant being the ‘Safelock’ steering wheel lock for which the patent has long expired, but it is still manufactured in different forms today by several companies. At the height of ‘Safelock’ production, New Era had 4 part-time engineering workers at Caroline Street plus an assembly line of 8 patients in the occupational therapy department of a nearby mental hospital. New Era was not exactly one of the engineering giants of the time! The New Era gear lever lock was adopted by the Roots car company as standard fitment to some export models while Halfords sold the ‘Safelock’ in significant quantities for a period of time. New Era was eventually sold to another company in about 1974, but by that time production of the products had dwindled to very low numbers.